Chance the Rapper announced Friday the Chicago Bulls would be donating $1 million to cash-strapped Chicago Public Schools. Charlie Wojciechowski. Chance the Rapper announced Friday the Chicago Bulls would be donating $1 million to cash-strapped Chicago Public Schools. Following his commitment to donate $1 million to Chicago Public Schools, Chance previously announced a "major announcement about his efforts to support Chicago Public Schools." Chance, whose real name is Chancelor Bennett, said as a parent and proud CPS graduate, he is dedicated to having students receive a quality education and also announced a new arts and literature fund. He aims to bring arts to schools have seen a decrease in five year graduation rates starting this fall. The announcement took place at 2:30 p.m. at Robeson High School in Chicago. Earlier this month, Bennett revealed he would donate $1 million to CPS as the underfunded district continues to languish amid the state’s ongoing budget impasse. He also said his not-for-profit, Social Works, would be accepting further donations on its website. For every $100,000 raised on the site, Bennett promised to chip in an additional $10,000. The Chicago emcee said he would start by donating $100,000 to 10 CPS schools, including Westcott Elementary. “Y’all wanna hear some Good news,” Bennett tweeted Thursday before releasing the full list of schools. Bennett said the funding — which comes from recent concert ticket sales — is a "call to action." Following a meeting last week with Gov. 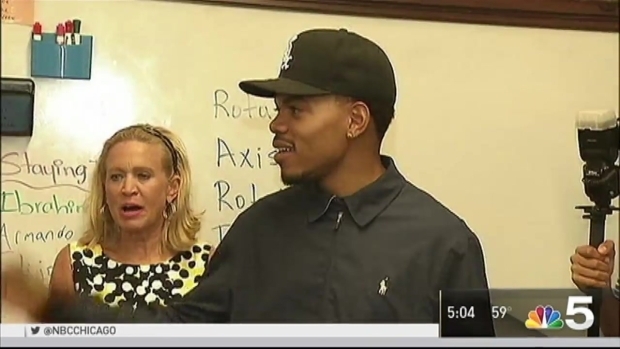 Bruce Rauner, Chicago musician Chance the Rapper announced Monday that he’s donating $1 million to Chicago Public Schools as the underfunded district continues to languish amid the state’s ongoing budget impasse. LeeAnn Trotter reports. "This isn’t about politics. This isn’t about posturing," Bennett told reporters Monday. "This is about taking care of the kids." Bennett also recently said he's looking for an intern.